Many people have a fashion accessory they can’t live without, or a collection of a singular defining garment, say, cardigans. 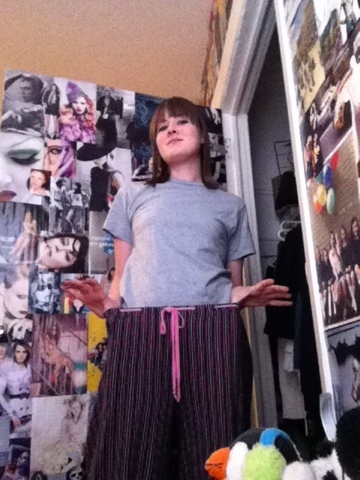 After some depressing soul searching, it has occurred to me that my fashion must-have is… Lounge pants. I know, it’s tragic, but really, don’t we all love some comfort? So I decided to use my self-timer feature (I’m still figuring it out, BTW) to show you my collection…of pants. These are my summertime staples. A friend gifted them to me second-hand (kind of like a clothing swap?) from Victoria’s Secret Pink. They’re kind of my “dress pants” thanks to the silky faux-satin drawstring, quelle fancy! Also, Stars! I’m a star! I feel like a star in these pants. Oh, these are by far my dorkiest pants. I bought them at the Salvation Army (BEFORE “thrifting” was cool!) for like, a dollar. They’re long, Aeropostale, and have monkeys and ducks playing rock instruments on them. The target audience was clearly awkward girls, so who am I to deny that? Kohl’s is a great resource for lounge pants. I bought these there – they’re kind of mid-weight, in-between season pants. Soft knit, but not too heavy, very flowy. These are also Kohl’s – my first fuzzy pants. They have sheep on them, and are known in my household as “sheepy pants”. Eli has tried them on, once, jealous of how cozy they looked on me. It was kind of hilar. Ahh, the cupcake pants, a la WAL*MART. These were on sale, and how can you resist XXL satin-ribbon-drawstring neon green pants with pink cupcakes on them? So hideous, they’re perfect. I hope you’ve enjoyed my Tour de Pants! Ah, yes. The lounge pant. A wardrobe basic on which to build a look I like to call "hobo chic." By the way, this look can only be achieved by adding big, knit old-man socks, gigantic boots, and a hat with a pom on it. Absolutely essential. Hahaha, this is sooo funny! I used to have a few of these, but somehow, they have all fallen by the wayside. Sigh. Maybe I should invest in a few again.